Three men have been arrested after a three-year-old was seriously injured in a suspected acid attack. The boy was in a pushchair when he was "deliberately attacked" at Home Bargains in Worcester at 14:15 BST on Saturday. West Mercia Police said the men, aged 22, 25 and 26, were arrested in London on suspicion of conspiracy to commit grievous bodily harm. 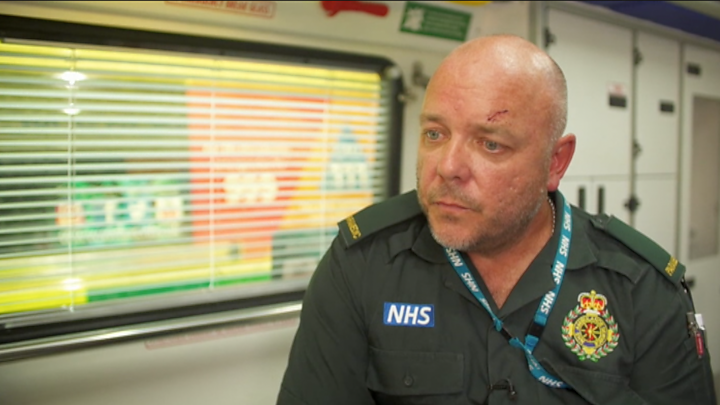 Paramedic Nick Carson, who treated the boy, told the BBC it was "horrific". Doctors discharged the toddler from hospital on Sunday afternoon. He was treated for serious burns to his arm and face and the "long-term implications" of his injuries are unknown, the force said. Ch Supt Mark Travis said the motive for the attack is so far "unclear". In an exclusive interview, the paramedic said the liquid used in the attack was "pink in colour, had quite a strong smell - not a bleach or acidy type smell". Mr Carson said the toddler was distressed to begin with, but calmed down very quickly once he was treated. The mother, he said, was "concerned but not panicking". The three arrested men were detained at an address in Walthamstow, the Metropolitan Police said. A 39-year-old man from Wolverhampton arrested on Sunday on suspicion of conspiracy to cause grievous bodily harm remains in police custody. "Acid or a corrosive substance" was either "thrown at or sprayed towards" the boy when he was with his family at Shrub Hill Retail Park, in Tallow Hill, police said. Ch Supt Travis said the family is receiving specialist medical and police support. "We are hoping the injuries won't be life changing. They are serious and at the moment it's just that little bit too soon to say, but things look positive. "Everything that can be done to provide support is being done, support for the family has been great. "I absolutely understand the community will be concerned, these are life changing incidents, this is something that lasts forever and we need to send a message that this is unacceptable." How do you treat a chemical burn? He said the force was keeping "an open mind as to the circumstances of the incident" and was still "appealing for anyone with information to come forward". The boy was with his mother at the time, and staff and shoppers tried to help before paramedics arrived. Police rejected any link between the attack and a protest by The English Defence League which took place in the centre of Worcester on Saturday, against plans to build a mosque in the city. Ch Supt Travis said: "We have looked at all the possible links and at the moment there is nothing to suggest there is any link between the activity on Saturday with the protests and this particular incident." 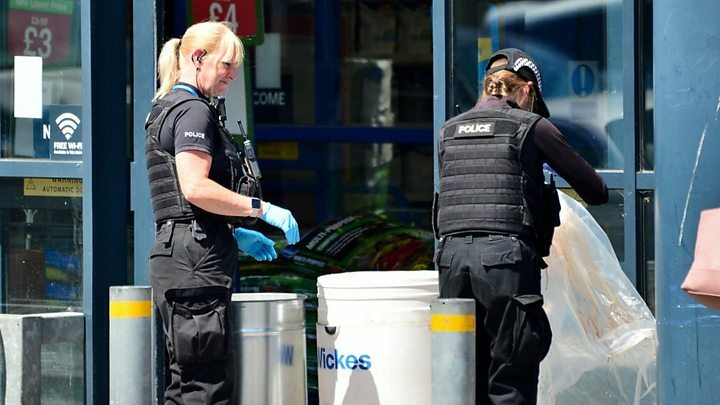 Image caption Bev Sidhu said the experience was "unnerving"
Bev Sidhu, who was in the area at the time, said: "The supervisor from Home Bargains came and said, 'Look, there was a hazardous acid used on someone'. "But that's all they let us know until the next day, but obviously it was just unnerving really, because it was just confusion." A Home Bargains spokesman said: "Our thoughts are with this young child and his family at this very difficult time." West Midlands Ambulance Service confirmed it was called to the scene and liaised with the Hazardous Area Response Team for specialist advice. They treated the boy at the shop before he was taken to hospital. Video Acid attacks: What should you do to treat a chemical burn?